Thoroughly entertaining thriller about secrets, lies (bureaucratic sort), and little guys beating the odds. “I’m a minnow challenging sharks,” says fledgling lawyer Gracie O’Brien to her best friend April Rosen. Waiting inside a federal courtroom in Washington, D.C., is a whole school of sharks—legal, power-suited, supercilious—representing the US government’s defense against a plaintiff whose chances everyone (including Gracie) rates at slim to none. It all started innocently enough when Arlie Rosen, April’s dad, took off with his wife on a pleasure cruise in his beloved Grumman, which shortly thereafter crashed into the Gulf of Alaska. Plane demolished, humans—miraculously enough—only scratched though nevertheless, post-rescue, still floundering in a sea of troubles. Actually, fate’s fickle finger began jabbing at Arlie long before the plunge. 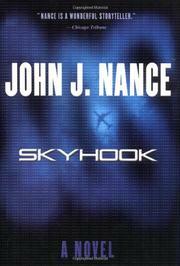 Flash back to Operation Skyhook: a brilliantly conceived program calculated to help aircraft survive terrorist activity. Nothing could be more hush-hush, so when Arlie Rosen, fog-bound, sideswiped a jet smack in the middle of a test run, it was the wrong place at the wrong time writ large. But Arlie’s not alone in being out of the loop. The FAA, too, is flying blind, and soon enough a self-righteous, mean-spirited inspector turns up with a private agenda at cross purposes to Skyhook. Arlie’s pilot’s license is lifted—lighting fires under loving April and loyal Gracie—and suddenly it’s David vs. Goliath, the phrase “due process” much in the air. To the government, the transcendent issue is keeping Operation Skyhook under wraps. To Arlie, it’s his pilot’s license and his constitutional rights that matter most. Big Government, armed to the teeth with resources, glaring down at little Arlie—an unequal contest? Well, never underestimate the power of aroused minnows. Nance’s amiable cast is partly what makes his tenth outing (Turbulence, 2000, etc.) work so well.